Community development support is an essential response measure in doing so. 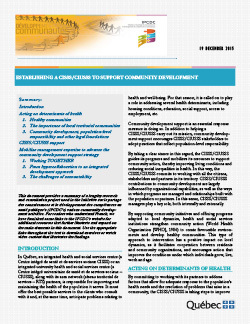 In addition to helping a CISSS/CIUSSS carry out its mission, community development support encourages CISSS/CIUSSS stakeholders to adopt practices that reflect population-level responsibility. By taking a clear stance in this regard, the CISSS/CIUSSS guides its programs and mobilizes its resources to support community action, thereby improving living conditions and reducing social inequalities in health. In this way, the CISSS/CIUSSS commits to working with all the citizens, stakeholders and partners in its territory. CISSS/CIUSSS contributions to community development are largely influenced by organizational capabilities, as well as the ways in which programs are managed and relationships built with the population or partners. In this sense, CISSS/CIUSSS managers play a key role, both internally and externally. By supporting community initiatives and offering programs adapted to local dynamics, health and social services institutions strengthen community action (World Health Organization [WHO], 1986) to create favourable environments and develop healthy communities. This type of approach to intervention has a positive impact on local dynamics, as it facilitates cooperation between residents and community organizations, and encourages action that improves the conditions under which individuals grow, live, work and age.